www.photomacrography.net :: View topic - why this happens? Posted: Thu Jul 04, 2013 5:43 pm Post subject: why this happens? Again I have take my 100 mm macro + 5D mark II + nikon 10x 0.25 infinite and the black circle appears again. if I have used in all my test EF lenses for full frame cameras why the black circle appears around ? Why using a MPE 65 and 300 L it not happen? The problem is not the camera lens itself but the lens-objective combo. 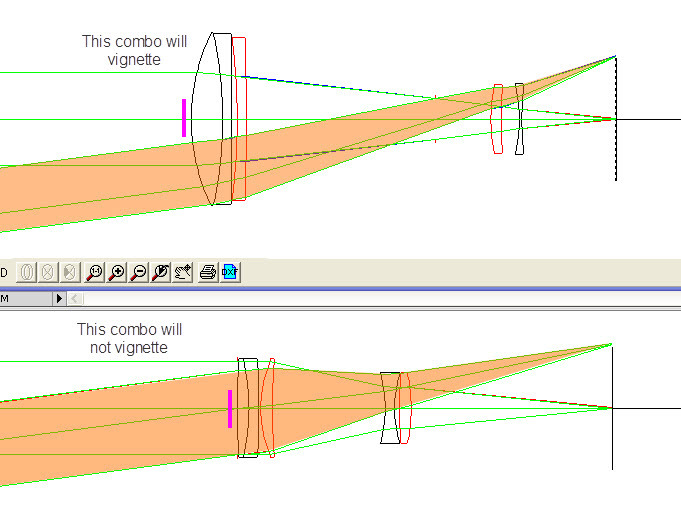 You're getting vignette when your combination try to form an image outside the image circle of the microscope objective. Be aware that microscope objectives are designed to form an image circle to fill the eyepiece round field, from 18 to 28 mm diameter (20-25mm usually). Nikon infinites are computed to provide the nominal magnification with a 200mm tube lens focussed to infinite. Some objectives like 10X planacrhomat CFIs will provide larger than expected image circle, but no one microscope objective is designed to cover full frame at reduced magnification lilke you're doing with the 180mm and 100mm lenses. With the 300mm you increase magnification so the actual fied of view is smaller. The lens construction, in special the diaphragm plane position also matters. The problem is not the camera lens itself but the lens-objective combo. ... The lens construction, in special the diaphragm plane position also matters. This is the key point. To avoid vignetting, the rear lens must be designed so that the frame can be filled even when light only comes through the center of the front surface. Some lenses are designed so that the edges of the frame must get their light through the edges of the front surface. Those lenses will vignette when used with an objective, because the objective provides only a small hole in the center of the lens. Here are two examples. Both lenses have the same focal length and f-number, but they have very different designs. The magenta block represents the rear of the objective. The top lens has its diaphragm placed far back, so that light can only reach the edges of the frame when it comes through the edge of the front surface. But the objective gives no light in that area, so the edges of the frame go dark. This combo will vignette. The bottom lens has its diaphragm placed far forward, so that light reaches the edges of the frame even when it comes just through the center of the front surface. This combo will not vignette. Note that both lenses work fine by themselves. It is only in combo that you get vignetting. The above are very important. Those are the only two adjustments that will affect the vignetting, once you have chosen the objective and the lens on the camera. Today had arrived the Canon Usm Ef 55-200mm 4.5 - 5.6 I so I´ve placed it + Nikon 10x infinite 0.25 + canon 5D mark II and the result is, that combo vignette. Weird because without the microscope objective not vignette, so, could be what you´ve mention above about the lens have the diaphragm placed far back. Anyone know if there are a lens at 200 mm than will not vignette using a 5d mark II? It also depends on the microscope objective being used. Not every 10x objective is the same, some will vignette on full frame, some don't. I have had nog vignetting with the Canon 5D III and the "famous" Nikon 10x NA 0.25 WD 10.5 on the Canon 200 mm f/2.8 L and on the Canon 70-300 f/4-5.6 (slightly less sharp than the prime lens). I borrowed this body and the 70-300 lens, but decided to go for the prime lens (and the 6D). I like the lens a lot, also for field photography because it is amazingly sharp.